Pieced Brain: Giveaway and Blog Hop! Wow! This is my second giveaway this month! The Quilting Gallery is celebrating its 5th anniversary this week, and it is hosting a Blog Hop Party. 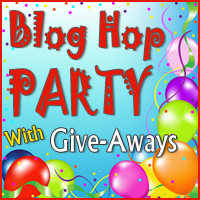 There is a whole list of bloggers participating, all with great giveaways! Before you head over to Quilting Gallery and the other blogs, read on for the details. 2. Bonus: leave me another comment telling me that you are a follower, for an extra entry! This giveaway will close December 15, 2012 at 5pm. The randomly chosen winner will be announced on Monday, December 17, here at this blog. I will ship internationally, too! A layer cake, courtesy of Riley Blake Designs. Ten-inch squares of every fabric... Can you imagine all the fun you could have? I am loving giving gifts to my fellow quilters and crafters, and I am sure you will love getting it, too! So, leave me a comment, but don't wait until next Monday to check out my blog again - you never know what I will come up with next! I need my Diet Coke fix. Thanks for chance to win. I have to have at least one Classic Coke every day! Telling my children I love them. Thanks for the giveaway! every morning, i get up early.. half an hour or so before the kids. and that's MY quiet time, before the kids are up and noisy, before the house gets messy, before i have to do anything! love it! Playing on my iPad in the morning! Snuggling with the kids before bed. I'm not a coffee drinker but drink sweet iced tea every day. What can I say? I'm a southern girl. I am an email follower :) Thank you for the chance to win this yummy fabric!!! Coffee light and sweet and breakfast every day! Daily routine? Hmmm.....mine is not a good one, but I don't drink coffee-so I need a diet soda for my caffeine. You guessed it - like to have 1 large cup of coffee with lots of cream each morning. I have to have a cup of tea first thing in the morning. I also lways take a cup of tea with me wherever I go. Hubby usually gets a little perturbed because he has to wait for me to make it and we are usually late! I can't survive without coffee!! Thanks for the giveaway! I follow Via Google Reader and e-mail. Brushing and flossing. Just do it! I have to have coffee in the morning! I start every day by walking out to the mailbox, bringing in the newspaper, and reading it while I have my morning cup of coffee. I could not possibly proceed with the day without putting in my contact lenses! I don't even feel totally awake until I have them in. I believe I follow this blog as well! I take a shower as soon as I get up and then I am ready to start the day. I do like morning coffee, as well. I must have several cups of black coffee in the morning as a matter of routine, and a bowl of cereal afterwards. Can't live without my morning coffee. Soy milk and a little bit of sugar! Definitely my morning coffee! Thanks so much for the chance to win such a wonderful giveaway! I need to eat breakfast in the morning. If I miss it, I get grumpy! Definitely a latte and the comics to start the day. Thanks for a fun question! I follow you by email. Thanks for another great giveaway! I really don't have a daily routine. Unless of course, it's chocolate at any time, anywhere. My early morning quilting hour from 6 to 7 AM. It is the only for sure time to fit in quilting and starts my day out right. Thanks for the chance at your giveaway. I can't skip breakfast. For me it really is the most important meal of the day. My morning ICED TEA!!! Yeah, I'm a icedtea-a-holic. First thing in the morning,all day long (no matter the weather) and last thing before bed at night! I not only follow, but I have Pieced Brain bookmarked! Have to have a cup of coffee every morning. So happily to be a follower. I have to wash my face before I go to bed. For some reason, I can't relax and settle down without doing that. I'm a morning tea drinker - can't do without my 2 cups of hot tea. But that's the limit to my caffeine. Thanks for the chance to win. My kids are now 7 and 10, and both avid readers, but my day just doesn't feel complete if I don't read to them at bedtime. Of course, now we read chapter books that interest me, too, but I love the time together, slowing down from our busy days. Thanks for the chance to win such a lovely prize! I'm an avid water drinker, I must have my water with me at all times. I'm a follower. Great giveaway ... thank you! Coffee - definitely! I tryed tea when I run out on coffee, but it's not the same. I know it's just in my brain, like an addiction, but I just have to have my coffee in the morning! I to get situated just so when I go to sleep. Otherwise I just lay there. Great giveaway. I am a follower and I will certainly be back to visit. I don't have time to comment usually, but I read a lot of blogs. Breakfast! I have to have it! I can not leave the house without eating something. Have to have a cup of coffee! I definitely couldn't live without my morning coffee, it just wouldn't be worth getting out of bed! I am a black coffee girl! thank you! I am a follower also! thank yoU! I can't live without my coffee! I drink tea. Every morning without fail! Wow, another give away already. Your inbox must be ready to pop. I can't live without breakfast. I would be useless within an hour if I didn't get it. Definitely coffee is the first thing I reach for in the morning and then my laptop to read all my feeds. Love it. Thanks for the chance. I have to get up an hour before anyone else is up to read emails and blogs with my morning coffee. Thanks for the great giveaway! A cup of hot tea in the morning, and another one mid-afternoon. Thanks for the great giveaway! It's absolutely the morning coffee. Every morning I get up start a cup of coffee and check my blog roll for new blogs in my favorites section! I am a follower of pieced brain. My daily habit that I don't seem able to live without is blog reading. I've got to get at least a couple of minutes in every day. Coke Zero - first thing in the morning - do not get in my way - do not even think (not even in a dream) about drinking the last cold one in the fridge. Yes, it is that important! Thanks for the great giveaway chance! Pido a gritos una buena taza de cafe. luego le abro la puerta al patio a mis dos perritas, y me tomo mi segunda taza de cafe. Ahora cuando ya estoy DESPIERTA! me hago el desayuno..frutas y tostadas..
Me gusta tu blog...y te sigo! I love staying in the bed five more minutes than I should. The bed always feels better than it does any other time! Yeah for another giveaway.I couldn't spend day without morning or daily coffee,hook an yarn in my hands for some crocheting and spending few hours on the net,also watching my favorites series on the day and movies on the night in bed before sleeping time. Brushing my teeth. Oh yucky if I don't do that. Also, cuddle time with my daughter. Anything else I can do without. I am also a follower on Google Reader. Burt's Bees chapstick at bedtime. At this point I'm pretty sure the smell of it helps me fall asleep. I usually like to have a glass of ice cold water at bedtime on my nightstand. Sometimes my apartment heat goes a little bonkers! Morning coffee is mandatory at this point. I have switched from a French press to the 'pour over' method. I like this much better. I've got to agree with morning coffee...I used to be a mostly tea drinker until I got a Keurig coffeemaker...love having a variety of one-cup choices. I don't really have a lot of routines! I don't drink coffee, and what I do in the morning varies depends on what time we wake up, the weather, and the mood of my preschooler. Lately every morning he's been getting to check his Advent calendar to see what our activity of the day is.It's been so much fun!! Oh, I MUST have that first cup of coffee in the morning! I have a cup or glass of ice coffee- not much coffee though, more milk :-) greek yoghurt with ancient grain granola and frozen berries!! Of course it has to be that 1st hot cup of morning coffee, hopefully before my kids wake up! My day just can't start without it. Gave up coffee about 7 years ago. Now the morning routine that just doesn't seem right missing is when Rusty out pomeranians gets up on his daddy for his eye rubs then rolls off daddy to cuddle between us to get his belly/chest rubs. When it doesn't happen the day just seems off now. thanks for the chance!! I found this via my new subscription! Am laid up with tonsil issues today, so going to check out the rest of your blog! I always love a morning cup of tea. Diet Pepsi in the morning! My husband is kind enough to put one in the house fridge every morning before leaving for work so when I wake up its there. Its like having my own personal "magic fridge." My morning tea.. I tried to do without it, but I just can't.. I would say my Diet Pepsi in the morning - now that I think about it, I didn't have one this morning. That must be my problem today!! My morning pot of tea - gets the day going! My morning routine is out-of-bed-into-the-shower. Without that the rest of the day never feels right! I must have my morning coffee! Thanks for the chance to win! Normally I would say morning coffee but I'm pregnant and can't stand to have it now! I guess it would be my sewing time once the kids are in bed! My one cup of coffee in the mornings! I'd be lost without it. After that I drink water all day, but that one cup of coffee really makes the day! Oh, I could use a layer cake, yes indeed. Layer cake and a cuppa Chai....purrfect breakfast. My Bible reading and breakfast. This time of year, also my light therapy! I'm not sure that I have a daily routine, but I guess it would have to be the days where my puppies run into the bedroom and wake me up! I have to have some breakfast to start my day. morning coffee! I love RB fabric! The first Diet Coke of the morning starts the day right. Ahhh - Coffee in the AM. Morning hug and smile from my hubby. thanks for the giveaway. Daily I have to have a glass of unsweet tea with splenda and lemon! A routine I can't live without is checking my mails. And most definitely brushing teeth! Thanks for the chance to win! I am now a brand new follower through Google Reader! Mine is coffee, coffee and more coffee. Thanks for a really great give-away. I am a new subscriber via FeedBurner email. I love a big glass of Strong Dark Tea with Lemon every morning! I MUST have coffee in the morning, first thing... don't know how I became so reliant on this morning coffee, but feel terrible without it!!!! I'm not much for routines, but most days I check my email and facebook. I absolutely must have coffee. Thanks for the chance to win such a nice prize. What a grand gift! Thanks for offering it. Oh yes, it's the coffee. Can get through the morning without a cup, or two. I need a nightly sugar fix after dinner. It could be a piece of chocolate or a cookie or two. Breakfast. You don't want to talk to me before I have something to eat. LOL. What a wonderful giveaway! It's the coffee for me! I really have to laugh at the number of bloggers who have that first cup of coffee. That could be me too ... then there is the dog who needs her walk ... can't get much done until that is taken care of ...Then there is my morning banana to prevent cramps ... aha, what creatures of habit we are! Morning shower followed by morning coffee!Thanks for the lovely giveaway! What a lovely give away. My morning routine is checking out the ocean and the mountain I have my morning coffee. Happy holidays. Like another commenter, I have a post-dinner sweet tooth. It may only require a small piece of dark chocolate, but I need something! Thanks for the chance to win! The first thing I do every morning is have a hot cup of tea with sweetener and milk. Thanks for the chance to win. Breakfast and checking e-mail gets my day started. I always start my morning with coffee and blog checking. listening to music - i have it on at work, in the car, etc. That looks like a lovely layer cake. Thanks for the opportunity to win your giveaway.